You can save 10% just by wearing this costume! You’d best start brushing up on your cockney accent, because this might be your next Halloween costume. Who doesn’t love geckos? That’s right, everyone loves them, and it’s partly due to the fame of one well-spoken gecko in a very popular ad campaign for car insurance. In some ways a doe-eyed gecko seems to be a surprising choice of a spokesperson, but people love him, gosh darn it—they also like to save hundreds on their car insurance. It’s those endearing brown eyes…they get you every time. According to the gecko, “people trust advertising icons.” Well said, my friend! Wouldn’t it be great to pop this little green bloke in your pocket and call him out whenever you need him? It would be great to have your very own spokesperson, plus he’d be a hoot to have at parties. 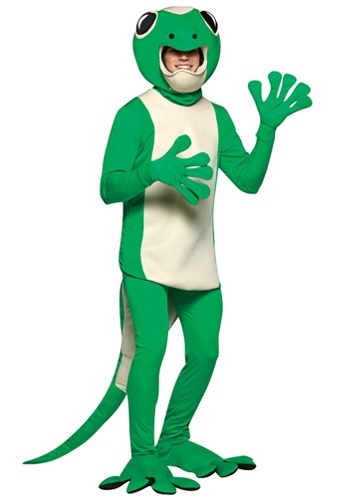 Speaking of parties, this Adult Gecko Costume is sure to be a hit! Did you know as far as jungle lizards are concerned, geckos do most the most “talking?” They communicate by chirping with their fellow species. So if you're going to trust anyone when it comes to the safety of you and your car, you might as well side with the guy who can actually do some talking. We bet this costume will be just as well received as this reputable reptile is. Plus, you can recite some commercials that will crack everyone up!